DNA sequencing has made its way to the clinic in a dramatic new way: detecting chromosomal defects very early in pregnancy. We've known for 25 years that traces of fetal DNA can be detected in a pregnant women's blood. But these traces are very small, and until now, we just didn't have the technology to detect an extra copy of a chromosome, where the DNA itself is otherwise normal. Last week, in a study published in The New England Journal of Medicine, Diana Bianchi and colleagues showed how DNA sequencing can detect an extra copy of a chromosome with remarkable accuracy. This report heralds a new era in prenatal DNA testing. First, some background: three copies of chromosome 21 causes Down syndrome, a genetic disease that causes intellectual disability and growth delays. Down syndrome is also called trisomy 21, where trisomy = 3 copies of a chromosome instead of the normal 2 copies. Much less common is Edwards syndrome, caused by three copies of chromosome 18. Edwards syndrome, or trisomy 18, has much more severe effects, with the vast majority of pregnancies not making it full term. Having an extra copy of any other chromosome almost always causes an early miscarriage. For many reasons, prospective parents want to know if a fetus carries any of these abnormalities. The accuracy of the new test is remarkable. Out of 1914 young, healthy pregnant women, there were just 8 pregnancies where the fetus had an extra chromosome, and the test detected all 8. What was most impressive was its low false positive rate: in total, the new DNA-based test had just 9 false positives (for either chromosome 21 or chromosome 18 trisomy). By contrast, the conventional screening test, which also identified all 8 true cases, produced 80 false positives, nearly 9 times as many as DNA sequencing. "if all women with positive results had .. decided to undergo an invasive procedure, there would have been a relative reduction of 89% in the number of diagnostic invasive procedures." 89% fewer invasive procedures is a huge reduction, not only in costs but in stress for the parents and risk to the baby (because amnio carries a small risk of miscarriage). With DNA sequencing getting faster and cheaper every year, it might be surprising that we are only now seeing it used to detect trisomy. The difficulty with detecting an extra copy of a chromosome is that the DNA sequence itself is normal. If you sequence the genome, you won't find any mutations that indicate that the fetus has an extra chromosome copy. This is where the remarkable efficiency of next-generation sequencing comes in. In a matter of hours, modern sequencing machines can sample millions of small fragments of DNA. We can use computational analysis to determine which fragments come from the fetus, and how many came from each chromosome. If any chromosome has three copies, we'll see a 50% increase in DNA from that chromosome. The power of sequencing lies in large numbers: because we can sequence many fragments from each chromosome, a 50% increase is easy to detect. The method that Bianchi used to detect trisomy was published in 2011 by Amy Sehnert and colleagues from 2011, some of whom are contributors to the new NEJM study. [Side note: they use a software program called Bowtie, developed by my former student Ben Langmead, to do the analysis.] The method is likely to get even better over time, further reducing the false positive rate. 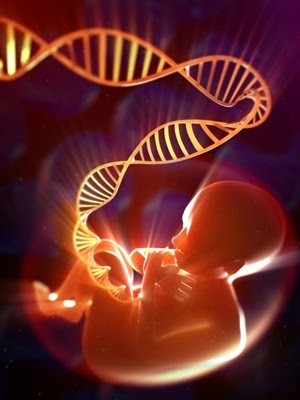 The American College of Obstetricians and Gynecologists has already recommended DNA testing for pregnant women at high risk of fetal aneuploidy (an extra chromosome). To be precise, they recommend that high-risk pregnant women be offered fetal DNA testing as an option, after they get genetic counseling. This new study, which was conducted in a low-risk population, shows that the benefits of prenatal DNA testing should offered to all women.